Lighting stairways has always been a bit of a challenge. There are many more choices to make today than there used to be. This is a good thing. Which one is the right one for you, though, is the real question. 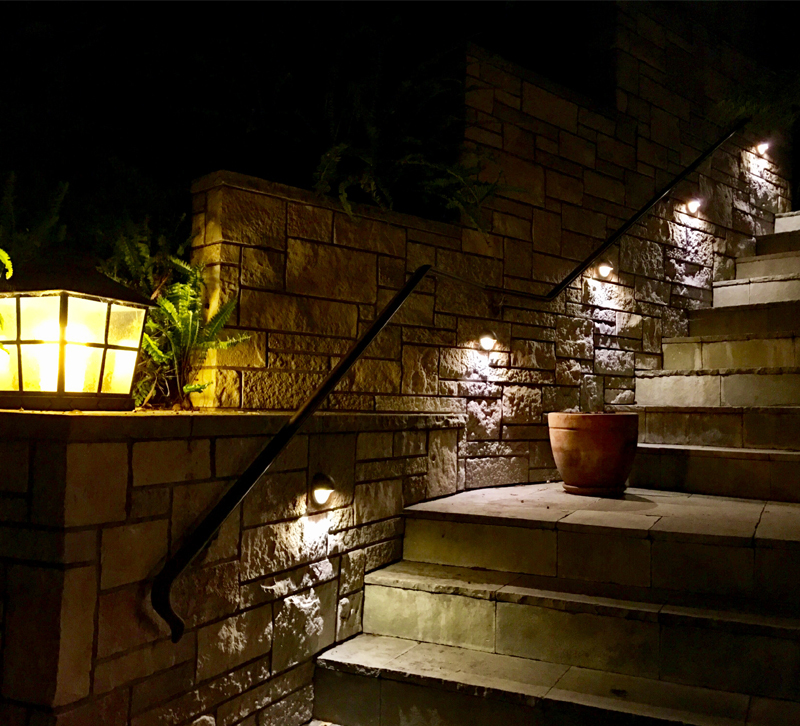 The primary function of step lights is to provide safe task lighting so that people can get safely from one level to the next without tripping. It’s hard enough to navigate your way after that second cocktail, we don’t want to add inadequate lighting to the mix. For me growing up, it seemed like all stairwell lighting was bad. It was either one light fixture mounted on the ceiling, which provided more glare than helpful illumination, or it was a series of recessed downlights that created unattractive scalloping effects on the side walls and were impossible to reach when a light bulb burned out. When step lights came into popular use, people didn’t really know where to place them. If they were mounted in the stair riser, it worked well as you were descending, but it was a little too glaring as you are ascending the stairs. If you installed them on the side wall, it wasn’t all that clear how far above the stair step they should be and how far apart they should be. You ended up with some steps being brightly lit, while other steps fell into shadow. 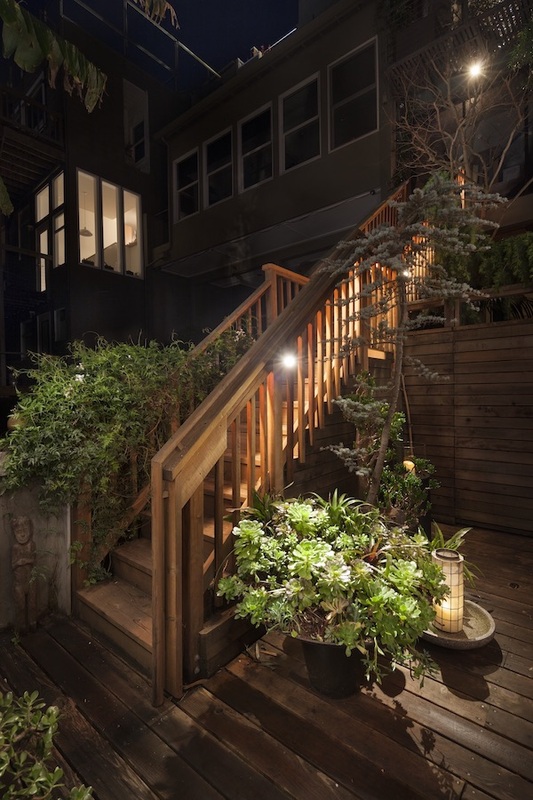 The rule of thumb is that you want stairway lighting to illuminate the steps as evenly as possible and as subtly as possible. LEDs have opened up a whole new world of possibilities. Linear strip LEDs can be mounted under the nosing of each of the individual stairs, or they can be mounted into the side walls, creating a continuous line of illumination. They can even be installed below the handrail. This is all exciting stuff. This continuous line of illumination by Pure Lighting is recessed into the wall and is only the depth of standard sheet rock, so the installation is pretty easy, even if it is an existing stairwell. If you decide to go the LED route, which I recommend, make sure to choose a color temperature that complements the rest of the lighting in your house. If your house is mostly incandescent or incandescent colored LEDs then I would recommend a color temperature between 2700K (the color of incandescent at full brightness) and 2400K (the color of dimmed incandescent). Also, remember to select a product with a high CRI of 90 or higher, so that the light has a hue quality close to that of incandescent. These products are often available in dimmable versions. Since they don’t draw a lot of power they can be left on at night so that a midnight raid on the refrigerator doesn’t end up in a nasty trip and fall incident.